A climate of impunity for employers, coupled with the threat of deportation, is forcing undocumented workers to bear the costs of injury and abuse. Leopoldo Zumaya stumbled while pruning a tree in 2004 and fell into a legal black hole. The apple picker’s broken leg got him promptly booted out of his work camp. And though he fought for the compensation he was entitled to, ultimately he received only a fraction of what a worker with immigration papers could have gotten under Pennsylvania state law. Like many products of the global economy, the undocumented immigrants who work in every US industry are treated like disposable goods, tossed away once worn out or damaged. But before an international commission this week, workers showed the scars that can’t be wiped away: the uncompensated damage wrought under a legal regime that renders them invisible. On Monday at the Inter-American Commission on Human Rights, a division of the Organization of American States, activists presented the stories of the undocumented to demand accountability from a government that they say systematically abets injury and abuse. The National Employment Law Project (NELP), the ACLU and other advocates, argued before the IACHR that a combination of regressive court rulings, draconian immigration enforcement, and restrictive state policies turn the law into a source of further trauma for harmed workers. For more than a decade, the advocates explained, “Hoffman’s progeny—the combination of state laws, employer cooperation with law enforcement, and other state and federal practices—has prevented workers like Petitioner Leopoldo Zumaya, who was severely injured on the job, from accessing their rightful workers’ compensation benefits.” While the compensation and insurance systems are generally inadequate for all workers (with work-related injuries costing them nearly $200 billion in 2012), immigrant workers are among the most vulnerable, working in rough, high-risk jobs and systematically denied basic health protections. Workers face more indirect injuries as well, like being intimidated from organizing amid fear of immigration enforcement by the police or federal agents, or the countless dollars lost through wage theft violations against immigrant workers. Advocates point out that even though the Hoffman ruling was somewhat limited—in that the foreclosure of remedies for undocumented workers applied specifically to National Labor Relations Act cases—the precedent has created a climate of impunity. This allows workers like Lizalde to slip silently through cracks in patchwork state and federal labor protections. 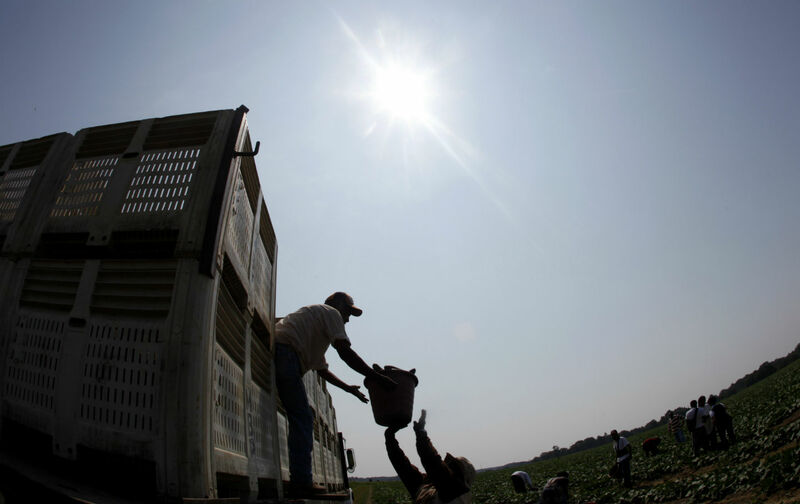 The IACHR petition argues that the Hoffman decision and related regulatory policies have led to the arbitrary application of labor protections to immigrant workers, often varying widely by state. Under this system, benefits available to injured construction workers in California are absent for their counterparts in Kansas. NELP Deputy Director Rebecca Smith tells The Nation via email, this legal uncertainty “has worsened an already constrained ability of workers to get access to the court and claim wages and benefits, as employers continue to argue that it has broader effect and that immigrants must disclose their status in courts and agencies.” And facing the threat of deportation at every turn, coupled with severe economic marginalization and a rational fear of government in general, the potential risks typically outweigh the potential rewards of coming forward about a grievance or injury. But for every undocumented worker forced into silence about her suffering, additional injury is done to all. Even “legal” and “native-born” workers are afflicted when immigrant coworkers are, for example, effectively barred from a union vote, because on the day of the election they’re stuck in a detention cell en route to the border. This climate of fear and insecurity not only impacts undocumented individuals but harms all workers by limiting their ability to organize and defend their labor rights and to report and reform hazardous working conditions. In response to the advocates appeal to the IACHR, the US has argued that the workers complaints are a domestic matter and their IACHR petitions are “inadmissible.” However, after years of procedural wrangling, the Commission finally granted them a hearing to address not only their individual claims but also “the worsening of workplace conditions and human rights violations for undocumented workers nationwide.” Indeed, back when Zumaya and Lizalde were first injured, there were still hopes for immigration reform in Congress. The decade of stagnation that has since passed shows that politicians are content to let labor standards erode. The ACLU and NELP argue that Congress can still pass targeted legislation to check the rollback on federal labor protections under Hoffman, as well as instruct states and immigration agencies to limit the related policies and enforcement practices. But Zumaya, who never fully recovered, and Lizalde, long exiled in Mexico, won’t ever be made whole. And millions like them walk the line each day, as gaps in the law leave nothing to break their fall.